I’ve just finished reading an article in The Telegraph entitled ‘Pumpkin Fever: celebrate winter squash’ written by Val Bourne. Essentially an instructional piece, describing different types of squash and how one might go about cultivating them, capped off with a ‘reader offer’ to buy some seeds. Whilst I enjoyed the article, the introdution came as a bit of a surprise. Now I must confess my own squash growing abilities leave a bit to be desired, six Butternuts this year sums it up, but as a participant in a couple of gardening forums I have been drooling over pictures of different varieties posted by other members for several weeks now. Certainly on our allotment site they are grown routinely by fellow plot holders. So ‘shunned’ is not really a word I would have associated with this vegetable at all. Let me know what you think in the comments. If you would like to read the original article the link to it is here. 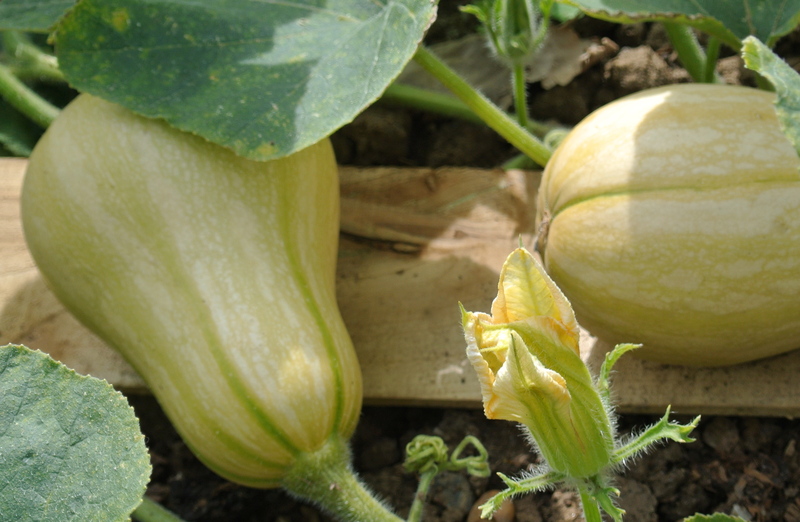 I love growing pumpkins, you just have to find the right one for your type of climate, soil etc. Last year I tried butternut and got one tiny one. This year I have tried the bright orange pear pumpkins and got a nice harvest. They do tend to take up a lot of space so maybe that is the reason why people do not grow them?. Funny fact, I have never grown parsnips…. Oh do try parsnips Laila, they really are lovely. A real hit of spice in the flavour. I think it might be a fair comment for people who don’t think of themselves as gardeners, and also because I don’t think squash features much in a lot of UK popular dishes. I love them but I’m mostly vegetarian – I know a lot of people who never meet one in the flesh (ha!) from one Hallowe’en to the next. They probably are a bit more inconvenient for the impulse gardener, too; lots of tomatoes, and chillis/peppers to some extent, available from nurseries, but squashes and courgettes in my experience are rarer, poorer – and often even more madly timed (I came across some last March – yes, March – alongside French beans on the trolleys outside a local discount store. It can only be a moneyspinner). And then there are the slugs. Oh, the slugs. I have a mixed history with squashes having yet to be really endowed with the space, soil and light that suits them really well. So however contrived the article I would welcome it as meaning there might be more cucurbits for me to ogle while I wait for my time to come. PS Marina di Chioggia is my absolute favourite winter squash so far. The mixed box of seed from Seeds of Italy is a lot of fun if you have space to fill! Thank you for taking the time to read. Squash, courgette et al are so easy to grow from seed, I think it’s definitely the way to go, especially if looking for the more unusual varieties.